As local guitarist, Ulyana Machneva, played, the diverse and inclusive group introduced themselves and asked Diny Adkins questions. Diny K. Adkins will be 80 years old next year and is memorable. After being presented a plaque entitled “Jewish Hero Award” for recognition of service for Holocaust awareness, the Holocaust survivor and educator from The Netherlands had almost 50 people mesmerized listening to her tragic story and looking at her colorful hair and piercings. 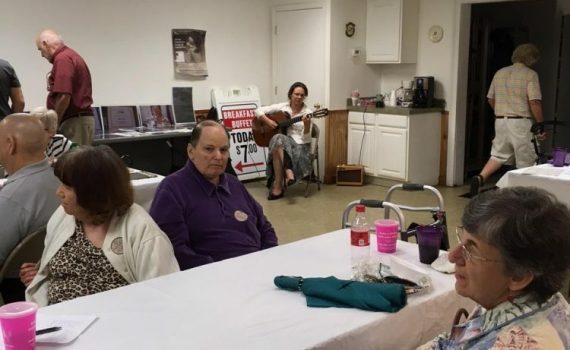 Ms. Adkins visited the monthly gathering of the Summerville CommUNITY Artists Heritage Series sponsored by the Summerville/North Area Jewish Community and the Community Resource Center. Held last Sunday at the Saul Alexander Masonic Lodge, for over an hour, the audience listened to Diny Adkins described the horrors she and her family faced during the Holocaust as she was hidden by nuns and told her parents were dead. Adkins lost 85 relatives during WWII. After the liberation, her parents who were also hiding, came to claim her. Diny then came to the United States and has spent much of her life telling her story to all but most especially the youth who she educates about the ups and downs of life, about tolerance, about bullying, suicide, love, and peace. Proceeds from sales of her book “Can Forgive, But Cannot Forget” are donated to Homeless and Wounded Veterans and the Holocaust Museum in DC. To hear Diny Adkins’ story, go to https://collections.ushmm.org/search/catalog/irn505530. For information about ongoing Summerville CommUNITY activities, go to http://summervillejewishcommunity.org.